To cultivate a learning culture in your organization, hiring curious people and allocating time to continuous learning is a good way to start. Like many companies, we are trying to find our own recipe for success, but the goal that unites all our efforts is clear: create an environment where everyone can learn and grow. To show you how we translate this pretty piece of writing into practice, here are three initiatives that we introduced to encourage learning and development in our company. Unless you’re part of a cross-team project, the chances are that questions like “What does Joe from Finance actually do?” or “How do new product features get released?” have crossed your mind at least once. To help people get to know their colleagues from other departments better, we started to run bi-weekly informal interviews. These so-called “Couch talks” are aimed to uncover our colleagues’ personal stories or provide insights into their work. Zuzana and her guest Michal Meško, CEO of Slovak bookstore company Martinus, in our Couch talk session. 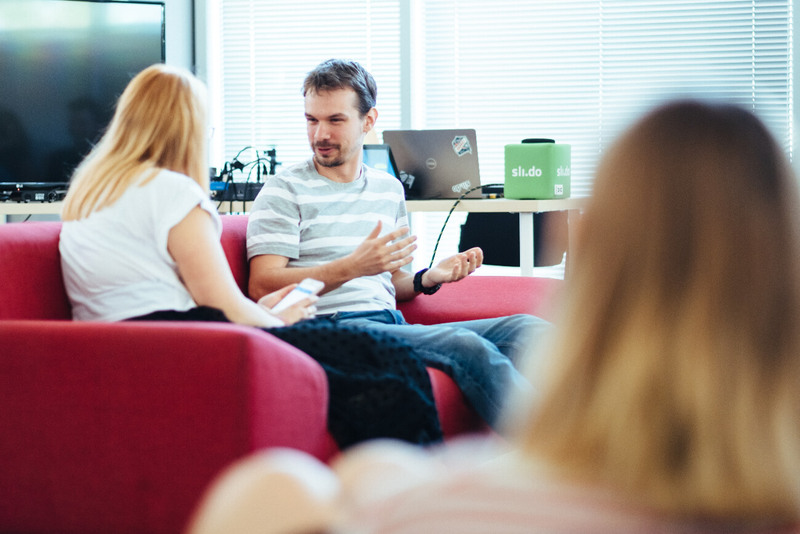 Since then, Zuzana hosts a 30-min fireside chat and Q&A with a chosen team member every other Thursday. All employees are invited to attend. We stream every Couch talk for our remote colleagues and record it for those unable to join live. Everyone can ask their questions through Slido, both before and during the talk. Zuzana reviews the questions as they come in and incorporates them into the discussion at the appropriate time. Since the start, our Couch talk seats have been occupied by over 30 employees from across the company. 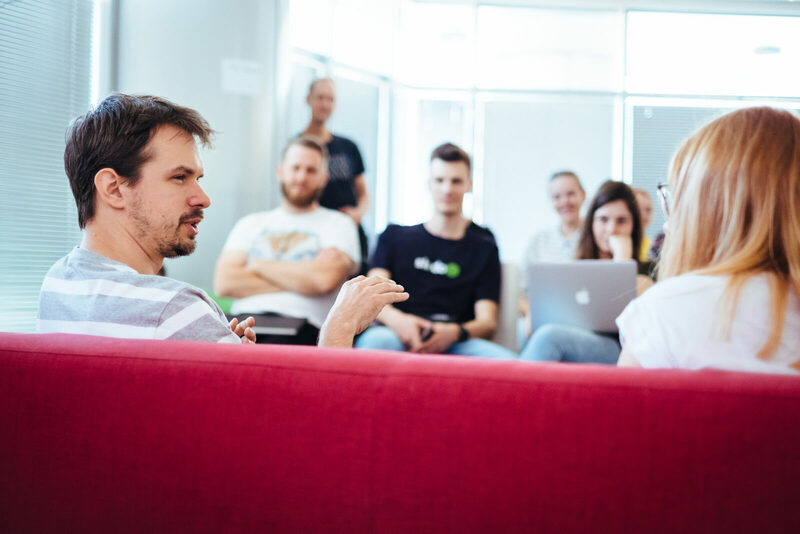 Over time, we started inviting external guests as well to share their unique insights, ranging from running a successful company to personal productivity tips. These spin-offs are a great addition to our internal sessions as they bring different perspectives and fresh inspiration to our daily work. When both our customer-facing and development teams started to grow, it became apparent that one-way communication on the latest product developments was no longer sufficient. Our colleagues from the Helpline team needed to know what was coming, what the team was working on and get hands-on experience of the new features before they went into production. That’s why we started running “Meet the Product” sessions. 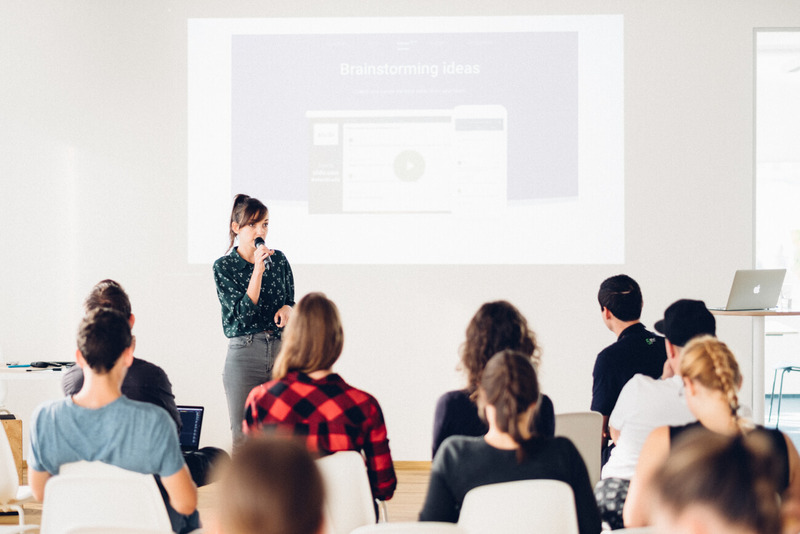 Every other week, Slido’s product managers take the stage and present the major updates, demos or other product announcements to the rest of the company. It’s an excellent opportunity to explain the context behind the product decisions, answer people’s questions and collect their feedback on the features in production. Special edition of our Meet the Product session dedicated to the launch of Slido’s third main feature Ideas. We encourage all the employees to join, especially those working in Customer Success. Every invitation includes a link to Slido for the Q&A by default and as with other meetings, the sessions are recorded for colleagues who can’t join live. Meet the Product sessions are an effective tool to communicate information in our company. They help us break the silos between departments, fill in the missing pieces of information and keep our teams aligned. At Slido, we’re passionate about constant learning and development. Staying true to our values, we started an initiative to support our colleagues in their self-development and expose them to new ways of thinking and doing things. We encourage everyone to read one book a month. It can be any book they want, in a format they prefer, and Slido will cover the costs. All we ask for in return is one’s personal commitment to finish the book in a month and build the habit of reading. Every month, we also offer one book recommendation by one of our team members, explaining what the book is about and why it’s worth the time. But reading’s just the start. To make sure the lessons learned are not forgotten with the last turned page, we form reading groups to discuss and share our thoughts with others. This is the most important part, as sharing one’s individual learnings with others multiplies the learning for everyone. So, once people finish the reading, we organize a roundtable session where our colleagues can discuss their learnings and key takeaways. These are then shared with wider teams in order to motivate them to join the next month’s reading challenge. 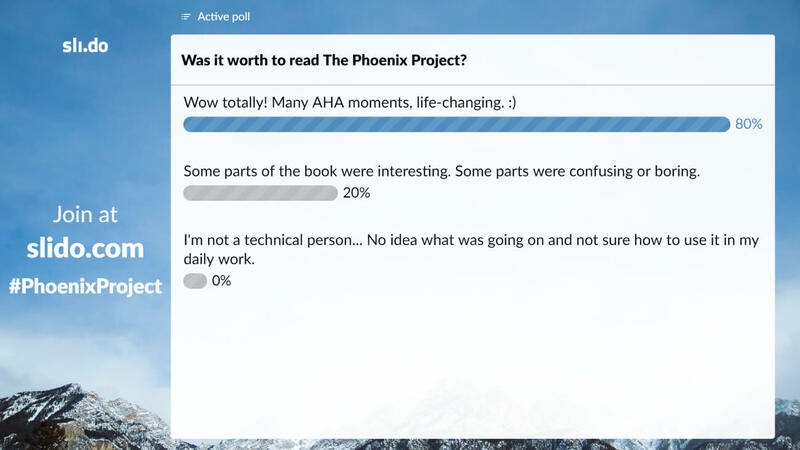 One of the feedback polls ran during the Book club discussions. “I like this initiative so much! It opened a new world for me. I didn’t read much before but now I am looking forward to go home to read a book :)” – Michal Valluš, API developer at Slido. Every learning initiative should lead to a change of behavior. When considering a new format, think about what you want your employees to take out of it. Whether it’s confidence in showcasing your product or building trust with teammates, having a clear purpose will help you deliver the program that best fits your team’s needs.